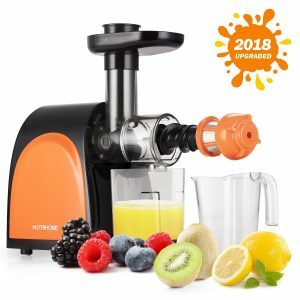 The black and orange Chefmos NutriHome Masticating Juicer (FU14ZZJNEW) is a slow cold press unit that was released with an upgrade in 2018. And the original model first appeared on Amazon.com in June 2017. The new model has a quieter and more efficient, better quality 150-watt DC motor (110V) and a good quality spiral propeller. It is able to juice a variety of fruits and veggies easily and taking all the juice out with as little pulp remaining as possible. There will be as little oxidation as possible thanks to the low-speed press with the auger rotating at 80rpm spindle speed. It will maintain about 40% more of the minerals, vitamins and healthy enzymes than other juicers with much less oxidation while extracting up to 30% more juice. The three-stage spiral propeller chops, squeezes and micro squeezes, getting as much juice as possible from your veggies and fruits. NutriHome Juicer is very easy to assemble and disassemble and comes with a brush to clean easily. Please clean it after each use so you can keep it free of bacteria. It has a feeder tube with a larger diameter so you will save time and effort on not having to cut the fruits and veggies. It will give you a cup of juice in less than a minute. And you’ll get a very smooth, clear, fresh and tasty juice with the pulp removed and dry. It can process green leafy veggies, fibrous stuff like ginger, wheat grass, carrot, beet and celery and a variety of fruits. You can also mix different fruits and vegetables, extracting the juice separately or at the same time. It runs relatively quietly at a noise level below 60 decibels and with much fewer vibrations. You will not be disturbing the people in your house or your neighbors. It is easy to operate as you put the spiral propeller and filter into the squeezing chamber and tighten the nut. And you hook up this combo to the juicer base, place the tray and put the ingredients with the propelling rod. Then you press the “On” button to start the machine and you can press the “R” button in case of clogging to reverse and avoid the blockage. You do not need to add any water when you’re juicing like you may need with some other units. It has a blade-less design that makes it safer for kids and adults, as there won’t be any potential cutting injuries. It is CE and ETL certified and the materials and components used are friendly to the environment and FDA food grade. The spiral propeller and squeezing chamber are FDA food-grade plastic and the motor body is solid ABS plastic. NutriHome Masticating Juicer weighs 10.87 pounds and measures 15 x 13.6 x 7.8 inches and will not occupy a lot of space on your kitchen bench. It looks nice and attractive with a modern design, is slow, works quietly, feels stable, makes very good quality juice, maintains the healthy nutrients, leaves very dry pulp, is very easy to disassemble and clean, and is offered at a low price. In the box, you’ll get the slow juicer, a pulp container, a juice container, a brush and a user manual with a year of warranty. 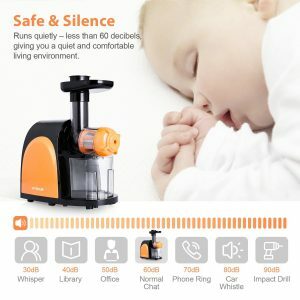 There are a total of 154 customer reviews since its first appearance on Amazon.com and scores 4.9 out of 5 stars at the time of this product review.